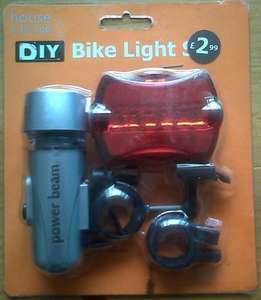 Was just browsing the local Poundies and spotted a bike light set marked as £2.99 but marked as £1.49 on the shelf - thought I couldn't go wrong for less than the cost of a pint. Good for a spare or even just for the rear red. Asked the wee lassie serving if it was limited to just this store but she confirmed it should be national. Pretty much sums up what I was about to type! Having messed with the rear red it is actually pretty decent - quite bright with a decent selection of flashing options. Access to batteries is easy enough (some of the cheapies are a nightmare). Mount works ok and light stays fixed quite well but can be easily removed. Not sure on how watertight it is though. Front is very mediocre - wouldn't hold up to many knocks, like I said good for visibility purposes - mount works ok.